Replenish, revitalize and nourish dry skin from top to toe with the Megamama body lotion. Uniquely formulated with Omegas 3, 6 and 9, replenish skin left dry and dull by pregnancy and reveal a body that’s radiant, smooth and beautifully hydrated. This luxurious lotion is rich in vital Omegas and superfoods to give your skin daily nourishment, keeping it healthy and strong. Use 1-2 pumps and apply to skin daily, smoothing upwards from toes to shoulders. Perfect lotion for dry skin! This is my second pregnancy and my skin is so dry, the cold weather is not happening. 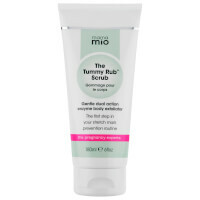 After using other Mama Mio products I decided to try this and was not disappointed! Keeps my skin moisturized all day! light yet packed with moisture! This is a great body moisturizer with ingredients that are safe for mom and baby. It is super light coming out of the bottle and easy to spread on the skin yet absorbs very quickly and does not leave any sticky or unwanted residue. The lotion has a light pleasant smell. To me, it smells herbal with a hint of apple but it could be my sense of smell / hormones. I'm glad to have found this moisturizer since so much can be absorbed through the skin. This is a great product! I have very dry skin and this lotion keeps my skin soft and glowing. I love that the ingredients are safe for pregnancy. It smells great and is not overpowering even when you are nauseous. I can not rave enough about this product. I loved that it was safe for me to use during pregnancy and also while breastfeeding. This lotion smells amazing! It has a nice texture when applying it to your skin, very moisturizing without leaving your skin feeling greasy or leaving behind a thick lotion feeling. Highly recommend this product to anyone looking for a great body lotion! I used this during pregnancy and breastfeeding just to be safe. It has great scent and texture. It feels very similar to the mio body cream and it's cheaper!